Lately my webcomics, though wonderful, are not inspiring me to doodle. Or rather, they are funnier than I feel like I can match. So instead I have taken to simply inserting myself in their worlds with my doodles... Guess it isn't bad, but its not the best either. So we will leave off the comics again for now. Here is the list I found (here) on the internet for a 30 Day monster drawing challenge. 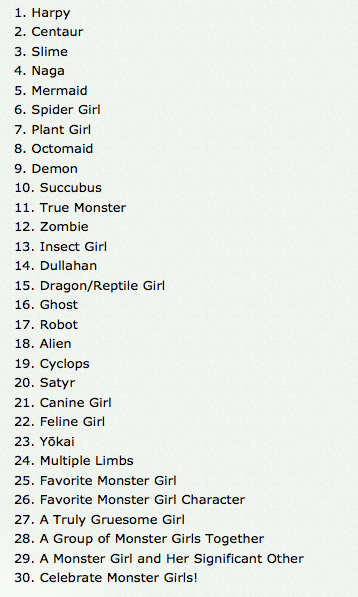 From what I have read it seems like the list was originally to draw monsters of each theme, but then someone somewhere said they should all be girls. And I liked that thought. I spent a lot of time doodling and trying to figure out the harpy before I put her in place. Decided she should have kind of a weird half shaved mohawk hair-do. First doodles. Trying to get frustration on the face and a pose. Maybe making the harpy younger would help? Nope. Took me a lot of time and I got frustrated. These were from last week. Today I thought, lets take another stab at it, and came up with something I liked enough to share. Sitting in a tree, painting her toenails, back to the half mohawk thingy. She wears a kimono top with the sleeves cut off, black capris. Kinda a hip young mall hopping harpy. I guess.